4. 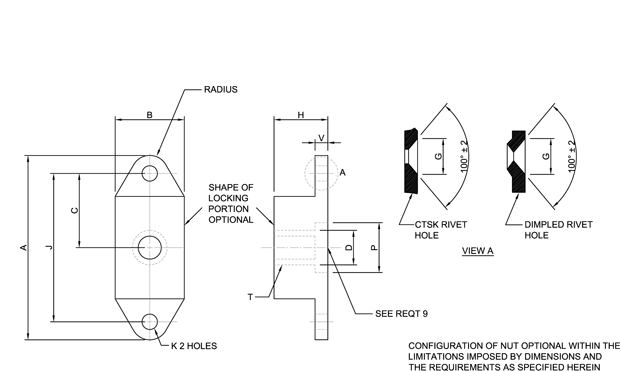 Design and usage limitations these nuts are designed to develop the tensile strength of bolts and screws with an ultimate tensile strength of 125 KSI based on the cross section area at the basic root diameter of the threads. These nuts are designed to be used on 3A external threads. These nuts shall be used in accordance with the limitations of MS33588. Only nuts which there are qualified products listed on QPL 25027 shall be used. MS21059 nuts can universally replace NAS686 and NAS1031 nuts of like material, thread size lubricant (dry film or non-dry film) rivet spacing and fastening method (plain rivet holes dimpled or countersunk rivet holes) but these NAS686 and NAS1031 nuts cannot universally replace MS21059 nuts.